The Treasures of the Yosemite. By John Muir, The Century Magazine, Vol. XL., No. 4 (August, 1890). View of the Yosemite Valley from Point Lookout--El Capitan on the left, the Bridal Veil Fall on the right, the Half Dome in the distance. THE Yosemite Valley, in the heart of the Sierra Nevada, is a noble mark for the traveler, whether tourist, botanist, geologist, or lover of wilderness pure and simple. But those who are free may find the journey a long one; not because of the miles, for they are not so many,--only about two hundred and fifty from San Francisco, and passed over by rail and carriage roads in a day or two,--but the way is so beautiful that one is beguiled at every step, and the great golden days and weeks and months go by uncounted. How vividly my own first journey to Yosemite comes to mind, though made more than a score of years ago. I set out afoot from Oakland, on the bay of San Francisco, in April. It was the bloom-time of the year over all the lowlands and ranges of the coast; the landscape was fairly drenched with sunshine, the larks were singing, and the hills were so covered with flowers that they seemed to be painted. Slow indeed was my progress through these glorious gardens, the first of the California flora I had seen. Cattle and cultivation were making few scars as yet, and I wandered enchanted in long, wavering curves, aware now and then that Yosemite lay to the eastward, and that some time, I should find it. One shining morning, at the head of the Pacheco Pass, a landscape was displayed that after all my wanderings still appears as the most divinely beautiful and sublime I have ever beheld. There at my feet lay the great central plain of California, level as a lake thirty or forty miles wide, four hundred long, one rich furred bed of golden Compositae. And along the eastern shore of this lake of gold rose the mighty Sierra, miles in height, in massive, tranquil grandeur, so gloriously colored and so radiant that it seemed not clothed with light, but wholly composed of it, like the wall of some celestial city. Along the top, and extending a good way down, was a rich pearl-gray belt of snow; then a belt of blue and dark purple, marking the extension of the forests; and stretching along the base of the range a broad belt of rose-purple, where lay the miners' gold and the open foothill gardens--all the colors smoothly blending, making a wall of light clear as crystal and ineffably fine, yet firm as adamant. Then it seemed to me the Sierra should be called, not the Nevada or Snowy Range, but the Range of Light. And after ten years in the midst of it, rejoicing and wondering, seeing the glorious floods of light that fill it,--the sunbursts of morning among the mountain-peaks, the broad noonday radiance on the crystal rocks, the flush of the alpenglow, and the thousand dashing waterfalls with their marvelous abundance of irised spray,--it still seems to me a range of light. But no terrestrial beauty may endure forever. The glory of wildness has already departed from the great central plain. Its bloom is shed, and so in part is the bloom of the mountains. In Yosemite, even under the protection of the Government, all that is perishable is vanishing apace. The Sierra is about 500 miles long, 70 miles wide, and from 7000 to nearly 15,000 feet high. In general views no mark of man is visible upon it, nor anything to suggest the wonderful depth and grandeur of its sculpture. None of its magnificent forest-crowned ridges seems to rise much above the general level to publish its wealth. No great valley or river is seen or group of well-marked features of any kind standing out as distinct pictures. Even the summit peaks, marshaled in glorious array so high in the sky, seem comparatively smooth and featureless. Nevertheless the whole range is furrowed with cañons to a depth of from 2000 to 5000 feet, in which once flowed majestic glaciers, and in which now flow and sing the bright Sierra rivers. Though of such stupendous depth, these cañons are not raw, gloomy, jagged-walled gorges, savage and inaccessible. With rough passages here and there, they are mostly smooth, open pathways conducting to the fountains of the summit; mountain streets full of life and light, graded and sculptured by the ancient glaciers, and presenting throughout all their courses a rich variety of novel and attractive scenery--the most attractive that has yet been discovered in the mountain ranges of the world. In many places, especially in the middle region of the western flank, the main cañons widen into spacious valleys or parks of charming beauty, level and flowery and diversified like landscape gardens with meadows and groves and thickets of blooming bushes, while the lofty walls, infinitely varied in form, are fringed with ferns, flowering plants, shrubs of many species, and tall evergreens and oaks which find anchorage on a thousand narrow steps and benches, the whole enlivened and made glorious with rejoicing streams that come dancing and foaming over the sunny brows of the cliffs, and through side cañons in falls of every conceivable form, to join the shining river that flows in tranquil beauty down the middle of each one of them. The most famous and accessible of these cañon valleys, and also the one that presents their most striking and sublime features on the grandest scale, is the Yosemite, situated on the upper waters of the Merced at an elevation of 4000 feet above the level of the sea. It is about seven miles long, half a mile to a mile wide, and nearly a mile deep, and is carved in the solid granite flank of the range. The walls of the valley are made up of rocks, mountains in size, partly separated from each other by side cañons and gorges; and they are so sheer in front, and so compactly and harmoniously built together on a level floor, that the place, comprehensively seen, looks like some immense hall or temple lighted from above. But no temple made with hands can compare with Yosemite. Every rock in its walls seems to glow with life. Some lean back in majestic repose; others, absolutely sheer or nearly so for thousands of feet, advance beyond their companions in thoughtful attitudes giving welcome to storms and calms alike, seemingly conscious, yet heedless of everything going on about them. Awful in stern, immovable majesty, how softly these mountain rocks are adorned and how fine and reassuring the company they keep--their feet set in groves and gay emerald meadows, their brows in the thin blue sky, a thousand flowers leaning confidingly against their adamantine bosses, bathed in floods of booming water, floods of light, while snow, clouds, winds, avalanches, shine and sing and wreathe about them as the years go by! Birds, bees, butterflies, and myriads of nameless wings stir the air into music and give glad animation. Down through the midst flows the crystal Merced--river of mercy--peacefully gliding, reflecting lilies and trees and the onlooking rocks, things frail and fleeting and types of endurance meeting here and blending in countless forms, as if into this one mountain mansion Nature had gathered her choicest treasures, whether great or small to draw her lovers into close and confiding communion with her. Down grade into the valley. Sauntering towards Yosemite up the foothills, richer and wilder become the forests and streams. At an elevation of 6000 feet above the level of the sea the silver firs are 200 feet high, with branches whorled around the colossal shafts in regular order, and every branch beautifully pinnate like a fern leaf. The Douglas spruce and the yellow and sugar pines here reach their highest developments of beauty and grandeur, and the rich, brown-barked libocedrus with warm, yellow-green plumes. The majestic sequoia, too, is here, the king of conifers, "the noblest of a noble race." All these colossal trees are as wonderful in the fineness of their beauty and proportions as in stature, growing together, an assemblage of conifers surpassing all that have yet been discovered in the forests of the world. Here, indeed, is the tree-lover's paradise, the woods, dry and wholesome, letting in the light in shimmering masses half sunshine, half shade, the air indescribably spicy and exhilarating, plushy fir boughs for beds, and cascades to sing us asleep as we gaze through the trees to the stars. On the highest ridges passed over on our way to Yosemite the lovely silver fir (Abies amabilis) forms the bulk of the woods, pressing forward in glorious array to the very brink of the walls on both sides and far beyond to a height of from 8000 to 9000 feet above the level of the sea. Thus it appears that Yosemite, presenting such stupendous faces of bare granite, is nevertheless embedded in magnificent forests. All the main species of pine, fir, spruce, and libocedrus are also found in the valley itself. But there are no "big trees" (Sequoia gigantea) in the valley or about the rim of it. The nearest are about ten miles beyond the boundary wall of the grant, on small tributaries of the Merced and Tuolumne. The sequoia belt extends along the western flank of the range, from the well-known Calaveras Grove on the north to the head of Deer Creek on the south, a distance of about two hundred miles, at an elevation of from about 5000 to 8000 feet above sea level. From the Calaveras to the south fork of King's River the species occurs only in small isolated groves or patches so sparsely distributed along the belt that two of the gaps that occur are nearly forty miles wide, one of them between the Stanislaus and Tuolumne groves, the other between those of the Fresno and King's River. 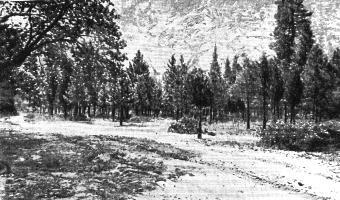 Hence southward, instead of forming small sequestered groups among the other conifers, the big trees sweep majestically across the broad, rugged basins of the Kaweah and Tule in noble forests a distance of nearly seventy miles, with a width of from three to ten miles, the continuity of this portion of the belt being interrupted only by deep cañons. The Fresno, the largest of the northern groves, occupies an area of three or four square miles, and is situated a short distance to the southward of the famous Mariposa Grove. Along the beveled rim of the cañon of the south fork of King's River there is a stately forest of sequoia about six miles long and two miles wide. This is the northernmost assemblage of big trees that may fairly be called a forest. Descending the precipitous divide between King's River and the Kaweah one enters the grand forests that form the main continuous portion of the belt. Advancing southward the trees become more and more irrepressibly exuberant, heaving their massive crowns into the sky from every ridge, and waving onward in graceful compliance with the complicated topography. The finest of the Kaweah portion of the belt is on the broad ridge between Marble Creek and the middle fork, and extends from the granite headlands overlooking the hot plains back to within a few miles of the cool glacial fountains. The extreme upper limit of the belt is reached between the middle and south forks of the Kaweah, at an elevation of 8400 feet. But the finest block of sequoia in the entire belt is on the north fork of the Tule River. 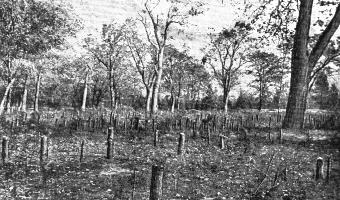 In the northern groups there are comparatively few young trees or saplings. But here for every old, storm-stricken giant there is one or more in all the glory of prime, and for each of these there are many young trees and crowds of eager, hopeful saplings growing heartily everywhere--on moraines, rocky ledges, along watercourses, and in the deep, moist alluvium of meadows, seemingly in hot pursuit of eternal life. Meadows" plowed up in October, 1888, to raise hay. Though the area occupied lily the species increases so much from north to south, there is no marked increase in the size of the trees. A height of two hundred and seventy-five feet and a diameter of twenty is perhaps about the average for full-grown trees: specimens twenty-five feet in diameter are not rare, and a good many are nearly three hundred feet high. The largest I have yet met in the course of my explorations is a majestic old monument in the new King's River forest. It is thirty-five feet and eight inches in diameter inside the bark four feet from the ground, and a plank of solid wood the whole width of the tree might be hewn from it with out the slightest decay. Under the most favorable conditions these giants live five or six thousand years though few of even the larger specimens are more than half as old. The sequoia seems to be entirely exempt from the diseases that afflict and kill other conifers--mildew, dry rot, or any other kind of rot. I never saw a sick sequoia, or one that seemed to be dying of old age. Unless destroyed by man, they live on indefinitely until burned, smashed by lightning, or cast down by the giving way of the ground on which they stand. These king trees, all that there are of their kind in the world, are surely worth saving, whether for beauty, science, or bald use. But as yet only the isolated Mariposa Grove has been reserved as a park for public use and pleasure. Were the importance of our forests at all understood by the people in general, even from an economic standpoint their preservation would call forth the most watchful attention of the Government. At present, however, every kind of destruction is moving on with accelerated speed. Fifteen years ago I found five mills located on or near the lower margin of the main sequoia belt, all of which were cutting big-tree lumber. How many more have been built since that time I am unable to say, but most of the Fresno group are doomed to feed the large mills established near them, and a company with ample means is about ready for work on the magnificent forests of King's River. In these mill operations waste far exceeds use. For after the young, manageable trees have been cut, blasted, and sawed, the woods are fired to clear the ground of limbs and refuse, and of course the seedlings and saplings, and many of the unmanageable giants, are destroyed, leaving but little more than black, charred monuments. These mill ravages, however, are small as yet compared with the comprehensive destruction caused by "sheepmen." Incredible numbers of sheep are driven to the mountain pastures every summer, and desolation follows them. Every garden within reach is trampled, the shrubs are stripped of leaves as if devoured by locusts, and the woods are burned to improve the pasturage. The entire belt of forests is thus swept by fire, from one end of the range to the other; and, with the exception of the resinous Pinus contorta, the sequoia suffers most of all. Steps are now being taken towards the creation of a national park about the Yosemite, and great is the need, not only for the sake of the adjacent forests, but for the valley itself. For the branching cañons and valleys of the basins of the streams that pour into Yosemite are as closely related to it as are the fingers to the palm of the hand--as the branches, foliage, and flowers of a tree to the trunk. 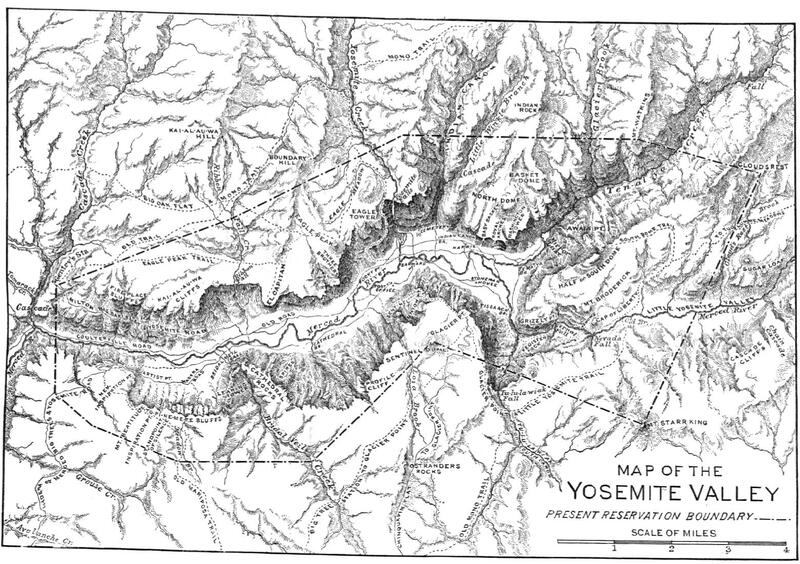 Therefore, very naturally, all the fountain region above Yosemite, with its peaks, cañons, snow fields, glaciers, forests, and streams, should be included in the park to make it an harmonious unit instead of a fragment, great though the fragment be; while to the westward, below the valley, the boundary might be extended with great advantage far enough to comprehend the Fresno, Mariposa, Merced, and Tuolumne groves of big trees, three of which are on roads leading to the valley, while all of them are in the midst of conifers scarcely less interesting than the colossal brown giants themselves. From the heights on the margin of these glorious forests we at length gain our first general view of the valley--a view that breaks suddenly upon us in all its glory far and wide and deep; a new revelation in landscape affairs that goes far to make the weakest and meanest spectator rich and significant ever-more. Along the curves and zigzags of the road, all the way down to the bottom, the valley is in sight with ever-changing views, and the eye ranges far up over the green grovy floor between the mighty walls, bits of the river gleaming here and there, while as we draw nearer we begin to hear the song of the waters. Gazing at random, perhaps the first object to gain concentrated attention will be the Bridal Veil, a beautiful waterfall on our right. Its brow, where it first leaps free from the rock, is about nine hundred feet above us; and as it sways and sings in the wind, with gauzy, sun-sifted spray half falling, half floating, it seems infinitely gentle and fine; but the hymn it sings tells the solemn power that is hidden beneath the soft clothing it wears. On the other side of the valley, opposite the Veil, there is another magnificent fall, called the Ribbon Fall, or Virgin's Tears. The "tears" fall from a height of about 3000 feet, and are most extravagantly copious when the snow is melting, coming hissing and roaring with force enough to drive a mile of mills, suggesting the "weeping skies" of cyclones and hurricanes. Just beyond this glorious flood the El Capitan rock is seen through the pine groves pressing forward beyond the general line of the wall in most imposing grandeur. It is 3300 feet high, a plain, severely simple, glacier-sculptured face of granite, the end of one of the most compact and enduring of the mountain ridges, standing there in supreme height and breadth, a type of permanence. Across the valley from here, above the Bridal Veil, are the picturesque Cathedral Rocks, nearly 2700 feet high, making a noble display of fine yet massive sculpture. They are closely related to El Capitan, having been hewn from the same mountain ridge by the Yosemite glacier when the valley was in process of formation. Mirror view of the Three Brothers. Beyond El Capitan the next in succession of the most striking features of the north wall are the Three Brothers, an immense mountain mass with three gables fronting the valley one above the other, the topmost nearly 4000 feet high. 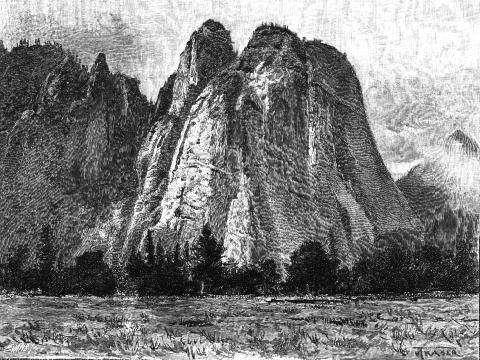 They were named for three brothers captured here during the Indian warns, sons of Tenaya, the old Yosemite chief. On the south wall opposite the Brothers towers the Sentinel Rock to a height of more than 3000 feet, a telling monument of the icy past. Sauntering up the valley through meadow and grove, in the company of these majestic rocks, which seem to follow as we advance gazing, admiring, looking for new wonders ahead where all about us is wonderful, the thunder of the Yosemite Fall is heard, air when we arrive in front of the Sentinel it is revealed in all its glory from base to summit, half a mile in height, and seeming to gush direct from the sky. But even this fall, perhaps the most wonderful in the world, cannot at first control our attention, for now the wide upper portion of the valley is displayed to view, with the North Dome, Royal Arches, and Washington Column on our left; Glacier Point Rock, with its magnificent sculpture, on the right; and in the middle Tissiack or Half Dome, the most beautiful and most sublime of all the mountain rocks about the valley. It rises in serene majesty from the fertile level into the sky to a height of 4750 feet. Here the valley divides into three branches the Tenaya, Nevada, and Illilouette cañons and valleys, extending back into the fountains of the High Sierra, with scenery every way worthy the relation they bear to Yosemite. In the south branch, a mile or two from the main valley, is the Illilouette Fall, 600 feet high, one of the most beautiful of all the Yosemite choir, but to most people inaccessible as yet on account of its rough, boulder-choked cañon. Its principal fountains of ice and snow lie in the beautiful and interesting mountains of the Merced group, while its broad, open basin in general is noted for the beauty of its lakes and extensive forests. Going up the north branch of the valley, we pass between the North Dome and the Half Dome, and in less than an hour come to Mirror Lake, the Dome Cascades, and Tenaya Fall, each interesting in its own way. Beyond the fall, on the north side of the cañon, is the sublime El Capitan-like rock called Mount Watkins; on the south the vast granite wave of Cloud's Rest, a mile in height; and between them the fine Tenaya Cascade with silvery plumes outspread on smooth, glacier-polished folds of granite, making a vertical descent in all of about 700 feet. Just beyond the Dome Cascades, on the shoulder of Mount Watkins, there is an old trail once used by the Indians on their way across the range to Mono, but in the cañon above this point there is no trail of any sort. Between Mount Watkins and Cloud's Rest the cañon is accessible only to mountaineers, and it is so dangerous in some places that I hesitate to advise even good climbers anxious to test their nerve and skill to pass through it. Beyond the Cascades no great difficulty will be encountered. A succession of charming lily gardens and meadows occur in filled up lake basins among the rock-waves in the bottom of the cañon, and everywhere the surface of the granite has a smooth-wiped appearance, and in many places, reflecting the sunbeams, shines like glass--phenomena due to glacial action, the cañon having been the channel of one of the main tributaries of the ancient Yosemite glacier. Ten miles above the valley we come to the beautiful Tenaya Lake, and here the cañon terminates. A mile or two above the lake stands the grand Sierra Cathedral, a building of one stone, hewn from the living rock, with sides, roof, gable, spire, and ornamental pinnacles, fashioned and finished symmetrically like a work of art, and set on a well-graded plateau about 9000 feet high, as if Nature in making so fine a house had also been careful that it should be finely seen. From every direction its peculiar form and graceful beauty of expression never fail to charm. Its height from the floor to the ridge of the roof is about 2500 feet, and among the pinnacles that adorn the front glorious views may be gained of the upper basins of the Merced and Tuolumne. Passing on each side of the Cathedral we descend into the delightful Tuolumne Valley, from which excursions may be made to Mount Dana, Mono Lake, Mount Lyell, to the many curious peaks that rise above the meadows on the south, and to the Big Tuolumne Cañon with its glorious abundance of rocks and falling, gliding, tossing water. For all these the spacious meadows near the Soda Springs form a delightful center. Returning now to Yosemite, and ascending the middle or Nevada branch of the valley, which is occupied by the main Merced River, we come within a few miles to the Vernal and Nevada falls, 400 and 600 feet high, and set in the novel and sublime rock-work. Above these, tracing the river, we are led into the Little Yosemite, a valley like the great Yosemite in form, sculpture, and vegetation. It is about three miles long, with walls 1500 to 2000 feet high, cascades coming over them, and the river flowing through the meadows and groves of the level bottom in tranquil crystal reaches. Beyond this there are four other little Yosemites in the main cañon, making a series of five in all, the highest situated a few miles below the base of Mount Lyell, at an elevation of about 7800 feet above the sea. To describe these, with all their wealth of Yosemite furniture, and the wilderness of lofty peaks above them, the home of the avalanche and treasury of the fountain snow, would take us far beyond the bounds of a magazine article. We cannot here consider the formation of these mountain landscapes--how the crystal rocks with crystal snow were brought to the light, making beauty whose influence is so mysterious on everybody who sees it; the blooming of the clouds; the fall of the snow; the flight of the avalanches; the invisible march of the grinding glaciers; the innumerable forms of the falling streams. Of the small glacier lakes so characteristic of these upper regions, there are no fewer than sixty-seven in the basin of the main middle branch, besides countless smaller pools, all their waters crisp and living and looking out on beautiful skies. In the basin of the Illilouette there are sixteen, in the Tenaya and its branches thirteen. in the Yosemite creek basin fourteen, and in the Pohono or Bridal Veil one, making a grand total of a hundred and eleven lakes whose waters come to sing at Yosemite. So glorious is the background of the great valley, so harmonious its relations to its widespreading fountains. On each side also the same harmony prevails. Climbing out of the valley by the subordinate cañons, we find the ground rising from the brink of the walls--on the south side to the fountains of Pohono or Bridal Veil Creek, the basin of which is noted for the extent and beauty of its meadows and its superb forests of silver fir; on the north side through the basin of the Yosemite Creek to the dividing ridge along the Tuolumne Cañon and the fountains of the Hoffman spur. In general views the Yosemite Creek basin seems to be paved with domes and smooth whaleback masses of granite in every stage of development--some showing only their crowns; others rising high and free above the girdling forests, singly or in groups. Others again are developed only on one side, forming bold outstanding bosses usually well fringed with shrubs and trees, and presenting the polished shining surfaces given them by the glacier that brought them into relief. On the upper portion of the basin broad moraine beds have been deposited and on these fine, thrifty forests are growing. Lakes and meadows and small spongy bogs may be found hiding here and there among the domes, in the woods, or back in the fountain recesses of Mount Hoffman, while a thousand gardens are planted along the banks of the streams. 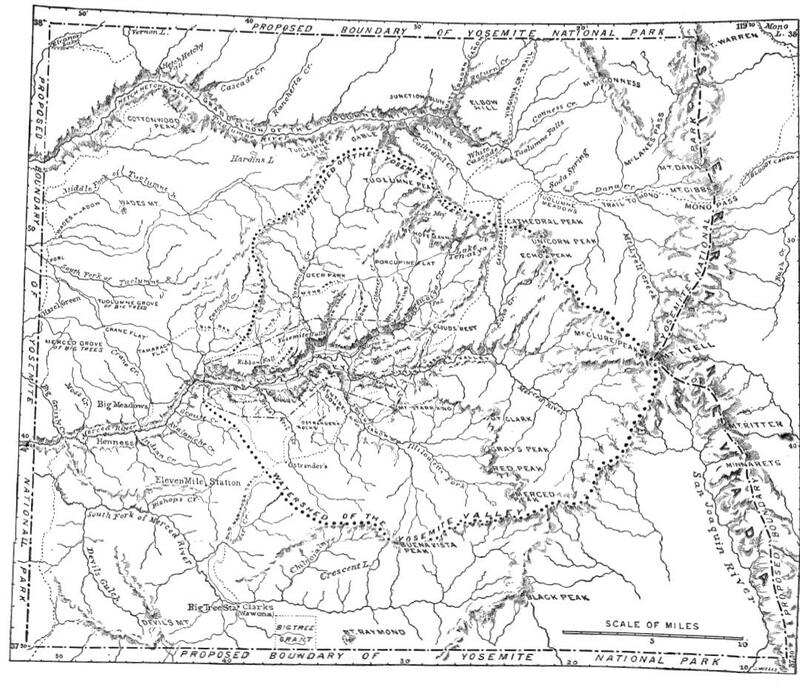 All the wide, fan-shaped upper portion of the basin is covered with a network of small rills that go cheerily on their way to their grand fall in the valley, now flowing on smooth pavements in sheets thin as glass, now diving under willows and laving their red roots, oozing through bogs, making tiny falls and cascades, whirling and dancing, calming again, gliding through bits of smooth glacier meadows with sod of Alpine agrostis mixed with blue and white violets and daisies, breaking, tossing among rough boulders and fallen trees, flowing together until, all united, they go to their fate with stately, tranquil air like a full-grown river. At the crossing of the Mono trail, about two miles above the head of the Yosemite Fall, the stream is nearly forty feet wide, and when the snow is melting rapidly in the spring it is about four feet deep, with a current of two and a half miles an hour. This is about the volume of water that forms the fall in May and June when there has been much snow the preceding winter; but it varies greatly from month to month. The snow rapidly vanishes from the open portion of the basin, which faces southward, and only a few of the tributaries reach back to perennial snow and ice fountains in the shadowy amphitheaters on the northern slopes of Mount Hoffman. The total descent made by the stream from its highest sources to its confluence with the Merced in the valley is about 6000 feet, while the distance is only about ten miles, an average fall of 600 feet per mile. The last mile of its course lies between the sides of sunken domes and swelling folds of the granite that are clustered and pressed together like a mass of bossy cumulus clouds. Through this shining way Yosemite Creek goes to its fate, swaying and swirling with easy, graceful gestures and singing the last of its mountain songs before it reaches the dizzy edge of Yosemite to fall 2600 feet into another world, where climates vegetation, inhabitants, all are different. Emerging from this last cañon the stream glides, in flat, lace-like folds, down a smooth incline into a small pool where it seems to rest and compose itself before taking the grand plunge. Then calmly, as if leaving a lake, it slips over the polished lip of the pool down another incline and out over the brow of the precipice in a magnificent curve thick sown with rainbow spray. In tracing the stream for the first time, getting acquainted with the life it lived in the mountains, I was eager to reach the extreme verge to see how it behaves in flowing so far through the air; but after enjoying this view and getting safely away I have never advised any one to follow my steps. The last incline down which the stream journeys so gracefully is so steep and smooth one must slip cautiously forward on hands and feet alongside the rushing water, which so near one's head is very exciting. But to gain a perfect view one must go yet farther, over a curving brow to a slight shelf on the extreme brink. This shelf, formed by the flaking off of a fold of the granite, is about three inches wide, just wide enough for a safe rest for one's heels. To me it seemed nerve-trying to slip to this narrow foothold and poise on the edge of such a precipice so close to the confusing whirl of the waters; and after casting longing glances over the shining brow of the fall and listening to its sublime psalm, I concluded not to attempt to go nearer, but did, nevertheless, against reasonable judgment. Noticing some tufts of artemisia in a cleft of rock, I filled my mouth with the leaves, hoping their bitter taste might help to keep caution keen and prevent giddiness; then I reached the little ledge, got my heels well set, and worked side-wise twenty or thirty feet to a point close to the out-plunging current. Here the view is perfectly free down into the heart of the bright irised throng of comet-like streams into which the whole ponderous volume of the fall separates a little below the brow. So glorious a display of pure wildness, acting at close range while one is cut off from all the world beside, is terribly impressive. Mirror view of Yosemite Falls. About forty yards to the eastward of the Yosemite Fall on a fissured portion of the edge of the cliff a less nerve-trying view may be obtained, extending all the way down to the bottom from a point about two hundred feet below the brow of the fall, where the current, striking a narrow ledge, bounds out in the characteristic comet-shaped masses. Seen from here towards noon, in the spring, the rainbow on its brow seems to be broken up and mingled with the rushing comets until all the fall is stained with iris colors, leaving no white water visible. This is the best of the safe views from above, the huge steadfast rocks, the flying waters, and the rainbow light forming one of the most glorious pictures conceivable. The Yosemite Fall is separated into an upper and a lower fall with a series of falls and cascades between them, but when viewed in front from the bottom of the valley they all appear as one. The Nevada Fall usually is ranked next to the Yosemite in general interest among the five main falls of the valley. Coming through the Little Yosemite in tranquil reaches, charmingly embowered, the river is first broken into rapids on a moraine boulder bar that crosses the lower end of the valley. Thence it pursues its way to the head of the fall in a very rough channel, cut in the solid granite, dashing on side angles, heaving in heavy, surging masses against bossy knobs, and swirling and swashing in potholes without a moment's rest. Thus, already chafed and dashed to foam, over-folded and twisted it plunges over the brink of the precipice as if glad to escape into the open air. But before it reaches the bottom it is pulverized yet finer by impinging upon a sloping portion of the cliff about half way down, thus making it the whitest of all the falls of the valley, and altogether one of the most wonderful in the world. 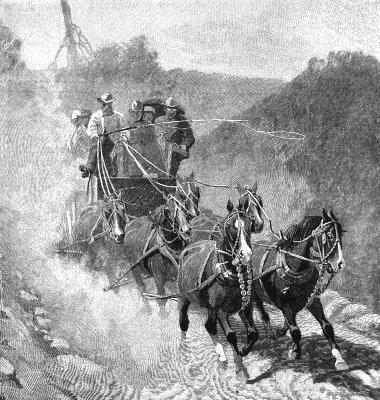 On the north side, close to the head of the fall, a slab of granite projects over the brink, forming a fine point for a view over the throng of streamers and wild plunging thunderbolts; and through the broad drifts of spray we see the river far below gathering its spent waters and rushing on again down the cañon in glad exultation into Emerald Pool, where at length it grows calm and gets rest for what still lies before it. All the features of the view correspond with the waters. The glacier-sculptured walls of the cañon on either hand, with the sublime mass of the Glacier Point Ridge in front, form a huge triangular, pit-like basin, which, filled with the roar of the falling river, seems as if it might be the hopper of one of the mills of the gods in which the mountains were being ground to dust. The Vernal, famous for its rainbows, is a staid, orderly, easy-going fall, proper and exact in every movement, with scarce a hint of the passionate enthusiasm of the Yosemite or the Nevada. Nevertheless it is a favorite with most visitors, doubtless because it is better seen than any other. A good stairway ascends the cliff beside it, and the level plateau at the head enables one to saunter safely along the edge of the stream as it comes from Emerald Pool and to watch its waters, calmly bending over the brow of the precipice, in a sheet 80 feet wide and changing from green to purplish gray and white until dashed on the rough boulder talus below. Thence issuing from beneath the clouds of the out-wafting spray we can see the adventurous stream, still unspent, beating its way down the rugged cañon in gray continuous cascades, dear to the ousel, until it sweeps around the shoulder of the Half Dome on its approach to the head of the main valley. Stairway on Cloud's Rest Trail. The Illilouette in general appearance most resembles the Nevada. The volume of water is less than half as great, but it is about the same height (600 feet), and its waters receive the same kind of preliminary tossing in a rocky irregular channel. Therefore it is a very white and fine-grained fall. When it is in full spring-time bloom it is partly divided by rocks that roughen the lip of the precipice, but this division amounts only to a kind of fluting and grooving of the column, which has a beautiful effect. It is not nearly so grand a fall as the upper Yosemite, or so symmetrical as the Vernal, or so airily graceful and simple as the Bridal Veil, nor does it ever display so tremendous an outgush of snowy magnificence as the Nevada; but in the exquisite fineness and richness of texture of its flowing folds it surpasses them all. One of the finest things I ever saw in Yosemite or elsewhere I found on the brow of this beautiful fall. It was in the Indian summer, when the leaf colors were ripe and the great cliffs and domes were transfigured in the hazy golden air. I had wandered up the rugged talus-dammed cañon of the Illilouette, admiring the wonderful views to be had there of the great Half Dome and the Liberty Cap, the foliage of the maples, dogwoods, rubus tangles, etc., the late goldenrods and asters, and the extreme purity of the water, which in motionless pools on this stream is almost perfectly invisible. The voice of the fall was now low, and the grand flood had waned to floating gauze and thin-broidered folds of linked and arrowy lace-work. When I reached the fall slant sun-beams were glinting across the head of it, leaving all the rest in shadow; and on the illumined brow a group of yellow spangles were playing, of singular form and beauty, flashing up and dancing in large flame-shaped masses, wavering at times, then steadying, rising and falling in accord with the shifting forms of the water. But the color changed not at all. Nothing in clouds or flowers, on bird-wings or the lips of shells, could rival it in fineness. It was the most divinely beautiful mass of yellow light I ever beheld--one of nature's precious sights that come to us but once in a lifetime. Looking up Merced River, on the way to Vernal Falls. For about a mile above Mirror Lake the cañon is level and well planted with fir, spruce, and libocedrus, forming a remarkably fine grove, at the head of which is the Tenaya Fall. Though seldom seen or described, this is, I think, the most picturesque fall in the valley. For a considerable distance above it Tenaya Creek comes rushing down, white and foamy, over a flat pavement inclined at an angle of about eighteen degrees. In time of high water this sheet of bright rapids is nearly seventy feet wide, and is varied in a very striking way by three parallel furrows that extend in the direction of the flow. 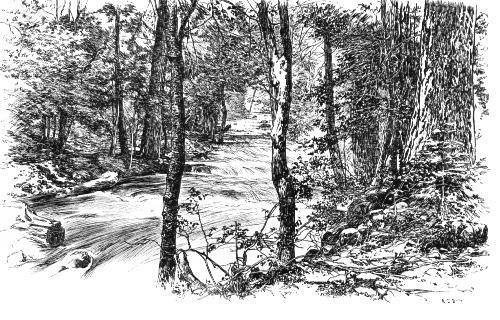 These furrows, worn by the action of the stream upon cleavage joints, vary in width, are slightly sinuous, and have large boulders firmly wedged in them here and there in narrow places giving rise, of course, to a complicated series of wild dashes, doublings, and arching bounds in the swift torrent. Just before it reaches the sheer precipice of the fall the current is divided, the left division making a vertical fall of about eighty feet in a romantic leafy nook, while the other forms a rugged cascade. Lunar rainbows or spraybows also abound; their colors as distinct as those of the sun, and as obviously banded, though less vivid. Fine specimens may be found any night at the foot of the upper Yosemite Fall, glowing gloriously amid the gloomy shadows of the cañon whenever there is plenty of moonlight and spray, silent interpreters of the heart-peace of Nature in the stormy darkness. Even the secondary bow is at times distinctly visible. The best point from which to observe them is on Fern Ledge. For some time after moonrise the arc has a span of about five hundred feet, and is set upright; one end planted in the boiling spray at the bottom, the other in the edge of the fall, creeping lower, of course, and becoming less upright as the moon rises higher. This grand arc of color, glowing in mild, shapely beauty in so weird and huge a chamber of night shadows, and amid the rush and roar and tumultuous dashing of this thunder-voiced fall, is one of the most impressive and most cheering of all the blessed evangels of the mountains. A wild scene, but not a safe one, is made by the moon as it appears through the edge of the Yosemite Fall when one is behind it. Once after enjoying the night-song of the waters, and watching the formation of the colored bow as the moon came round the domes and sent her beams into the wild uproar, I ventured out on the narrow bench that extends back of the fall from Fern Ledge and began to admire the dim-veiled grandeur of the view. I could see the fine gauzy threads of the outer tissue by having the light in front; and wishing to look at the moon through the meshes of some of the denser portions of the fall, I ventured to creep farther behind it while it was gently wind-swayed, without taking sufficient thought about the consequences of its swaying back to its natural position after the wind pressure should be removed. The effect was enchanting. Fine, savage music sounded above, beneath, around me; while the moon, apparently in the very midst of the rushing waters, seemed to be struggling to keep her place, on account of the ever-varying form and density of the water masses through which she was seen, now darkened by a rush of thick-headed comets, now flashing out through openings between them. I was in fairyland between the dark wall and the wild throng of illumined waters, but suffered sudden disenchantment; for, like the witch scene in Alloway Kirk, "in an instant all was dark." Down came a dash of spent comets, thin and harmless-looking in the distance, but desperately solid and stony in striking one's shoulders. It seemed like a mixture of choking spray and gravel. Instinctively dropping on my knees, I laid hold of an angle of the rock, rolled myself together with my face pressed against my breast, and in this attitude submitted as best I could to my thundering baptism. The heavier masses seemed to strike like cobblestones, and there was a confused noise of many waters about my ears--hissing, gurgling, clashing sounds that were not heard as music. The situation was easily realized. How fast one's thoughts burn at such times! I was weighing the chances of escape. Would the column be swayed a few inches away from the wall, or would it come yet closer ? The fall was in flood, and not so lightly would its ponderous mass be swayed. My fate seemed to depend on a breath of the "idle wind." It was moved gently forward, the pounding ceased, and I once more revisited the glimpses of the moon. But fearing I might be caught at a disadvantage in making too hasty a retreat, I moved only a few feet along the bench to where a block of ice lay. Between the ice and the wall I wedged myself, and lay face downwards until the steadiness of the light gave encouragement to get away. Somewhat nerve-shaken, drenched, and benumbed, I made out to build a fire, warmed myself, ran home to avoid taking cold, reached my cabin before daylight, got an hour or two of sleep, and awoke sane and comfortable, better, not worse, for my wild bath in moonlit spray. 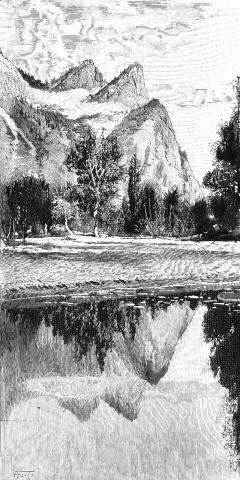 Owing to the westerly trend of the valley and its vast depth there is a great difference between the climates of the north and south sides--greater than between many countries far apart; for the south wall is in shadow during the winter months, while the north is bathed in sunshine every clear day. Thus there is mild spring weather on one side of the valley while winter rules the other. Far up the north-side cliffs many a nook may be found closely embraced by sun-beaten rock-bosses in which flowers bloom every month of the year. Even butterflies may be seen in these high winter gardens except when storms are falling and a few days after they have ceased. Near the head of the lower Yosemite Fall in January I found the ant lions lying in wait in their warm sand-cups, rock ferns being unrolled, club mosses covered with fresh growing points, the flowers of the laurel nearly open, and the honeysuckle rosetted with bright young leaves; every plant seemed to be thinking about summer and to be stirred with good vital sunshine. Even on the shadow side of the valley the frost is never very sharp. The lowest temperature I ever observed during four winters was +7°. The first twenty-four days of January had an average temperature at 9 A. M. of 32°, minimum 22°; at 3 P. M. the average was 40° 30', the minimum 32°. Throughout the winter months the spray of the upper Yosemite Fall is frozen while falling thinly exposed and is deposited around the base of the fall in the form of a hollow truncated cone, which sometimes reaches a height of five hundred feet or more, into the heart of which the whole volume of the fall descends with a tremendous roar as if pouring down the throat of a crater. In the building of this ice-cone part of the frozen spray falls directly to its place, but a considerable portion is first frozen upon the face of the cliff on both sides of the fall, and attains a thickness of a foot or more during the night. When the sun strikes this ice-coating it is expanded and cracked off in masses weighing from a few pounds to several tons, and is built into the walls of the cone; while in windy, frosty weather, when the fall is swayed from side to side, the cone is well drenched, and the loose ice-masses and dust are all firmly frozen together. The thundering, reverberating reports of the falling ice-masses are like those of heavy cannon. They usually occur at intervals of a few minutes, and are the most strikingly characteristic of the winter sounds of the valley, and constant accompaniments of the best sunshine. While this stormy building is in progress the surface of the cone is smooth and pure white, the whole presenting the appearance of a beautiful crystal hill wreathed with folds of spray which are oftentimes irised. But when it is wasting and breaking up in the spring its surface is strewn with leaves, pine branches, stones, sand, etc., that have been brought over the fall, making it look like a heap of avalanche detritus. After being engulfed and churned in the stormy interior of the crater the waters of the fall issue from arched openings at the base, seemingly scourged and weary and. glad to escape, while belching spray spouted up out of the throat past the descending current is wafted away in irised drifts to the rocks and groves. Anxious to learn what I could about the structure of this curious ice-hill, I tried to climb it, carrying an ax to cut footsteps. Before I had reached the base of it I was met by a current of spray and wind that made breathing difficult. I pushed on backward, however, and soon gained the slope of the hill, where by creeping close to the surface most of the blast was avoided. Thus I made my way nearly to the summit, halting at times to peer up through the wild whirls of spray, or to listen to the sublime thunder beneath me, the whole hill sounding as if it were a huge, bellowing, exploding drum. I hoped that by waiting until the fall was blown aslant I should be able to climb to the lip of the crater and get a view of the interior; but a suffocating blast, half air, half water, followed by the fall of an enormous mass of ice from the wall, quickly discouraged me. The whole cone was jarred by the blow, and I was afraid its side might fall in. Some fragments of the mass sped past me dangerously near; so I beat a hasty retreat, chilled and drenched, and laid myself on a sunny rock in a safe place to dry. The Bridal Veil, upper Yosemite, and the Tu-ee-u-la-la of Hetch Hetchy (the next cañon to the north), on account of their height and exposure, are greatly influenced by winds. The common summer winds that come up the river cañon from the plains are never very strong, partly on account of the roughness of the way they have to travel. But the north winds of winter do some very wild work, worrying the falls and the forests, and hanging snow banners, a mile long, on the peaks of the summit of the range. One morning I was awakened by the pelting of pine cones on the roof of my cabin, and found, on going out, that the north wind had taken possession of the valley, filling it with a sea-like roar, and, arousing the pines to magnificent action, made them bow like supple willows. The valley had been visited a short time before by a succession of most beautiful snowstorms, and the floor, and the cliffs, and all the region round about were lavishly laden with winter jewelry. Rocks, trees, the sandy flats and the meadows, all were in bloom, and the air was filled with a dust of shining petals. the gale increased all day, and branches and tassels and empty burs of the silver pine covered the snow, while the falls were being twisted and torn and tossed about as if they were mere wisps of floating mist. 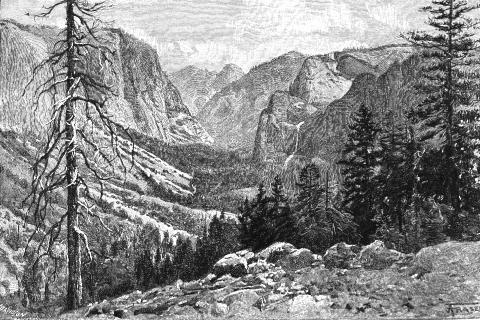 In the morning the great ponderous column of the upper Yosemite Fall, increased in volume by the melting of the snow during a warm spell, was caught by a tremendous blast, bent upwards, torn to shreds, and driven back over the brow of the cliff whence it came, as if denied admission to the valley. This kind of work would be kept up for ten or fifteen minutes, then a partial lull in the storm would allow the vast torrent to arrange its tattered skirts, and come back again to sing on in its accustomed course. Amid all this rocking and bending and baffling of the waters they were lighted by a steady glare of sunlight, strangely white from spicules of snow crystals. The lower fall, though less exposed, was yet violently swirled and torn and thrashed about in its narrow cañon, and at times appeared as one resplendent mass of iris colors from top to bottom, as if a hundred rainbows had been doubled up into a mass four or five hundred feet in diameter. In the afternoon, while I watched the upper fall from the shelter of a pine tree, it was suddenly arrested in its descent at a point about half way down, and was neither blown upward nor driven aside, but was simply held stationary in mid air, as if gravitation below that point in the path of its descent had ceased to act. The ponderous flood, weighing hundreds of tons, was sustained hovering, hesitating, like a bunch of thistledown, while I counted 190. All this time the ordinary amount of water was coming over the cliff and accumulating in the air, swedging and widening and forming an irregular cone 700 feet high tapering to the top of the wall, the whole standing still, resting on the invisible arm of the north wind. At length, as if commanded to go on again, scores of arrowy comets shot forth from the bottom of the suspended mass as if escaping from separate outlets. 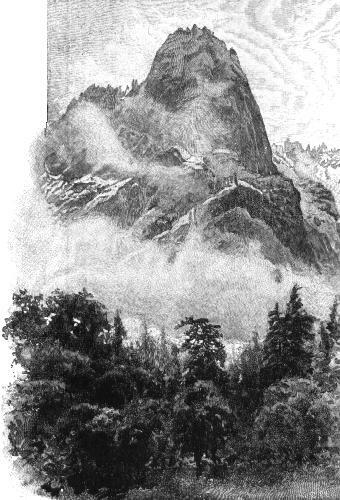 The brow of El Capitan was decked with long streamers of snow-like hair, Cloud's Rest was enveloped in drifting gossamer films, and the Half Dome loomed up in the garish light like some majestic living creature clad in the same gauzy, wind-woven drapery, upward currents meeting overhead sometimes making it smoke like a volcano. done in other parts of the valley. ("Process"
Glorious as are these rocks and waters when jumbled in storm winds, or chanting rejoicing in everyday dress, there is a glory that excelleth, when rare conditions of weather meet to make every valley, hollow, gorge, and cañon sing with flood waters. Only once have I seen Yosemite in full bloom of flood during all the years I have lived there. In 1871 the early winter weather was delightful; the days all sunshine, the nights clear and serene, calling forth fine crops of frost crystals for the withered ferns and grasses, the most luxuriant growths of hoar-frost imaginable. In the afternoon of December 16, when I was sauntering on the meadows, I noticed a massive crimson cloud growing in solitary grandeur above Cathedral Rocks, its form scarcely less striking than its color. It had a picturesque, bulging base like an old sequoia, a smooth, tapering stem, and a bossy, down-curling crown like a mushroom; all its parts colored alike, making one mass of translucent crimson. Wondering what the meaning of that lonely red cloud might be, I was up betimes next morning looking at the weather, but all seemed tranquil as yet. Towards noon gray clouds began to grow which had a close, curly grain like bird's-eye maple, and late at night rain fell, which soon changed to snow; next morning about ten inches lay on the meadows, and it was still falling in a fine, cordial storm. During the night of the 18th a torrent of rain fell on the snow, but as the temperature was 34°, the snow line was only a few hundred feet above the bottom of the valley, and to get out of the rainstorm into the snowstorm one had only to climb a little above the tops of the pines. The streams, therefore, instead of being increased in volume, were diminished by the storm, because the snow sponged up part of their waters and choked the smaller tributaries. 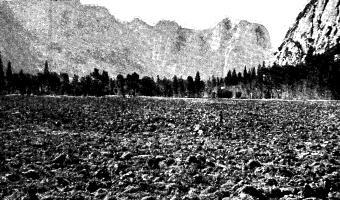 But about midnight the temperature suddenly rose to 42°, carrying the snow line far beyond the valley, over the upper basins perhaps to the summit of the range, and next morning Yosemite was rejoicing in a glorious flood. Tile warm, copious rain falling on the snow was at first absorbed and held back, and so also was that portion of the snow that the rain melted, and all that was melted by the warm wind, until the whole mass of snow was saturated and became sludgy, and at length slipped and rushed simultaneously from a thousand slopes into the channels in wild extravagance, heaping and swelling flood over flood, and plunging into the valley in one stupendous avalanche. Awakened by the roar, I looked out and at once recognized the extraordinary character of the storm. The rain was still pouring in torrents, and the wind, blowing a gale, was working in passionate accord with the flood. The section of the north wall visible from my cabin was covered with a network of falls--new visitors that seemed strangely out of place. Eager to get into the midst of the show, I snatched a piece of bread for breakfast and ran out. The mountain waters, suddenly liberated, seemed to be holding a grand jubilee. The two Sentinel cascades rivaled the great falls at ordinary stages, and across the valley by the Three Brothers I caught glimpses of more falls than I could readily count; while the whole valley throbbed and trembled, and was filled with an awful, massive, solemn, sea-like roar. After looking about me bewildered for a few moments I tried to reach the upper meadows, where the valley is widest, that I might be able to see the walls on both sides, and thus gain general views. But the meadows were flooded, forming an almost continuous lake dotted with blue sludgy islands, while innumerable streams roared like lions across my path and were sweeping forward rocks and logs with tremendous energy over ground where tiny gilias had been growing but a short time before. 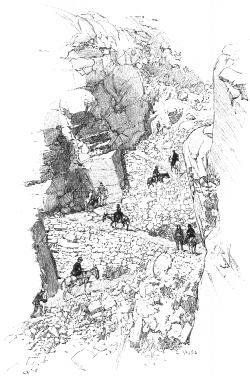 Climbing into the talus slopes, where these savage torrents were broken among earthquake boulders, I succeeded in crossing them, and forced my way up the valley to Hutchings' Bridge, where I crossed the river and waded to the middle of the upper meadow. Here most of the new falls were in sight, probably the most glorious assemblage of waterfalls ever displayed from any one standpoint in the world. On that portion of the south wall between Hutchings' and the Sentinel there were ten falls plunging and booming from a height of nearly 3000 feet, the smallest of which might have been heard miles away. In the neighborhood of Glacier Point there were six; between the Three Brothers and Yosemite Fall, nine; between Yosemite and Royal Arch Falls, ten; from Washington Column to Mount Watkins, ten; on the slopes of Half Dome, facing Mirror Lake, eight; on the shoulder of Half Dome, facing the valley, three--fifty-six new falls occupying the upper end of the valley, besides a countless host of silvery threads gleaming everywhere. In all the valley there must have been upward of a hundred. As if celebrating some great event, falls and cascades came thronging in Yosemite costume from every groove and cañon far and near. All summer visitors will remember the comet forms of the Yosemite Fall and the laces of the Bridal Veil and Nevada. In the falls of this winter jubilee the lace forms predominated, but there was no lack of thunder-toned comets. The lower portion of one of the Sentinel cascades was composed of two main white shafts, the space between them filled in with chained and beaded gauze of intricate pattern, through the singing threads of which the purplish-gray rock could be dimly seen. The series above Glacier Point was still more complicated in structure, displaying every form that one would imagine water might be dashed and combed and woven into. Those on the north wall between Washington Column and the Royal Arch Fall were so nearly related that they formed an almost continuous sheet, and these again were but slightly separated from those about Indian Cañon. The group about the Three Brothers and El Capitan, owing to the topography and cleavage of the cliffs back of them, were more broken and irregular. The Tissiack cascades were comparatively small, yet sufficient to give that noblest of mountain rocks a glorious voice. In the midst of all this rejoicing the Yosemite Fall was scarce heard until about three o'clock in the afternoon. Then I was startled by a sudden thundering crash as if a rock avalanche had come to join the chorus. This was the flood wave of Yosemite Creek, which had just arrived, delayed by the distance it had to travel, and by the choking snows of its widespread fountains. Now, with volume tenfold increased beyond its springtime fullness, it took its place as leader of the glorious choir. No idle, silent water was to be found anywhere; all sang loud or low in divine harmony. And the winds sang too, playing on every pine, leaf, and rock, surging against the huge brows and domes and outstanding battlements, deflected hither and thither, broken into a thousand cascading currents that whirled in the hollow. And these again, reacting on the clouds, eroded immense cavernous spaces in their gray depths, sweeping forward the resulting detritus in ragged trains like the moraines of glaciers. These cloud movements in turn published the work of the winds, giving them a visible body, and enabling us to trace their wild career. As if endowed with independent motion, some detached cloud would rise hastily upon some errand to the very top of the wall in a single effort, examining the faces of the cliffs, and then perhaps as suddenly descend to sweep imposingly along the meadows, trailing draggled fringes through the pines, fondling their waving spires with infinite gentleness, or gliding behind a grove or a single tree bring it into striking relief, while all bowed and waved in solemn rhythm. Sometimes as they drooped and condensed, or thinned to misty gauze, half the valley would be veiled at once, leaving here and there some lofty headland cut off from all visible connection with the walls, looming alone, dim, spectral, as if belonging to the sky--visitors, like the new falls, come to take part in the festival. Thus for two days and nights in measureless extravagance the storm went on, and mostly without spectators, at least of a terrestrial kind. I saw nobody out--bird, bear, squirrel, or man. Tourists had vanished months before, and the hotel people and laborers were out of sight, careful about getting cold and wet, and satisfied with views from doors and windows. The bears, I suppose, were in their boulder dens in the cañons, the squirrels in their knot-hole nests, the grouse in close fir groves, and the small singers in the chaparral. Strange to say, I did not see even the water-ousel, though he must have greatly enjoyed the storm. This was the most sublime waterfall flood I ever saw--clouds, winds, rocks, waters, throbbing together as one. And then to contemplate what was going on simultaneously with all this in other mountain temples: the Big Tuolumne Cañon--how the white waters were singing there, and the winds, and how the clouds were marching. In Hetch Hetchy Valley also, and the great King's River Yosemite, and in all the other cañons and valleys of the Sierra from Shasta to the southernmost fountains of the Kern--five hundred miles of flooded waterfalls chanting together. What a psalm was that!